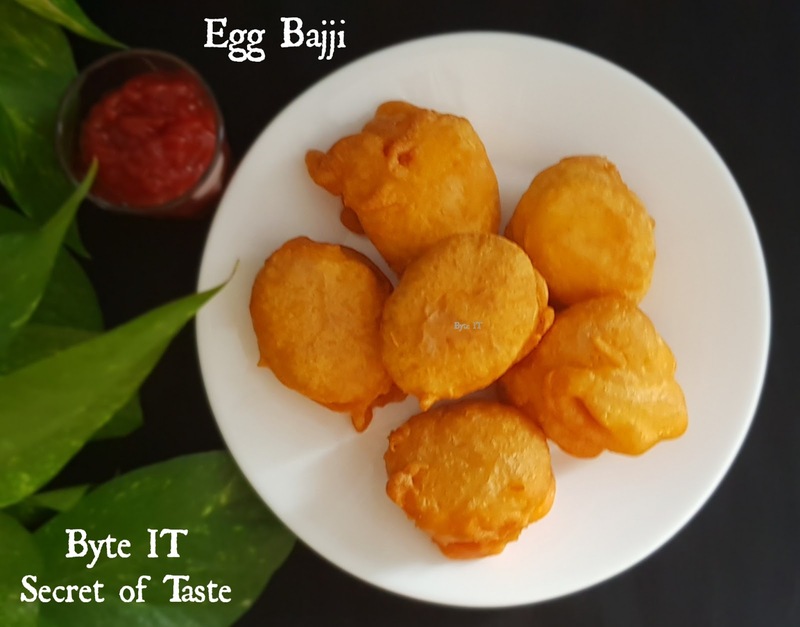 Simple Crispy deep fried snack made with gram flour batter and boiled egg. It is one of my all time favourite snack recipe. It makes a great snack for kids as well. It can be served as a tasty evening snack with a hot tea or coffee. Let's check out the recipe. * Boil egg. Remove shells and cut them in half. Keep it ready. * In a deep bowl, add gram flour, red chilli powder, turmeric powder, asafoetida, salt, baking soda and rice flour. Combine well. * To this add water littile by littile to make a thick paste. * Heat oil in a pan or Kadai for deep frying. * Dip egg into the gram flour batter and deep fry it till golden brown colour. Drain on to some paper towels. Crispy and tasty egg bajji ready. 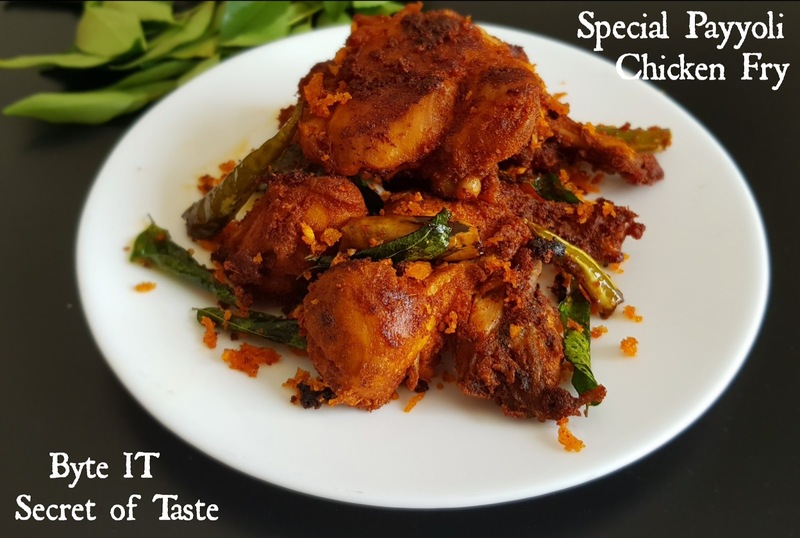 Payyoli chicken fry, a dry chicken fry with the authentic malabar flavours. This delicious chicken fry is very popular in Payyoli, which is a place situated in North Malabar coast of Calicut,Kerala. The chicken is marinated with dried red chilli paste and many flavourful spices, deep fried in coconut oil and served with crispy and spicy fried coconut, curry leaves and green chillies. Let's check out the recipe! Boil 15 Kashmiri red chilli for about 15 - 20 minutes. Switch off the flame and strain it. Cool Kashmiri red chilli completely and grind into fine paste. * Marinate the grated coconut with the above ingredients and keep it aside. * In a bowl, add Kashmiri red chilli paste, ginger paste, meat masala, vinegar, salt, some curry leaves and coconut oil. Combine well. * Then add chicken pieces and mix well. Let it stay for 1 hour or more. * Heat coconut oil, add marinated chicken pieces. Deep fry till cooked and chicken turns slightly crispy. Keep aside. * Add the marinated grated coconut to oil and deep fry till golden in colour. Take care not to burn the coconut. * Serve the chicken with fried coconut -curryleaves - greenchilli mix on top. Be careful while frying coconut. It may burn fast. Keep on stirring till it turns light golden colour on high flame. Take out of the oil and strain excess oil from it. This is so yummy delicious with a wonderful coconut flavour or rafaello candy flavour. A soft cake topped with dessicated coconut, whipped cream and almonds. * Preheat oven 180°C. Grease and line bottom and sides of a pan with parchment paper. * Combine all purpose flour, salt, baking powder, coconut powder and dessicated coconut. Keep it aside. * Beat egg white and powdered sugar until fluffy. Then add vanilla essence and fold it. Keep it aside. * In another bowl, beat egg yolks. Then add the dry ingredients and oil. Fold it well. (Don't beat). * Mix the egg white mixture with egg yolk mixture. (Dont beat) Fold it slowly. * Pour this batter in the prepared greased pan. * Bake at 180°C for about 30 - 40 minutes or until done. * Let it cool for about 15 minutes. Remove from pan and cool completely on a rack. * In a dry bowl, beat the whipping cream until soft peaks formed. (If whipping cream do not contain sugar, add powdered sugar and beat). Keep aside. * When the cake is completely cut into two layers. * Place one cake layer on serving plate. Spread coconut milk over the layer. Spread prepared whipping cream. On top add some crushed almonds and dessicated coconut. * Add the second layer on top and repeat the same above process. * Garnish with dessicated coconut on top and sides of the cake. Last Garnish with rafaello balls. * Refrigerate until ready to serve. 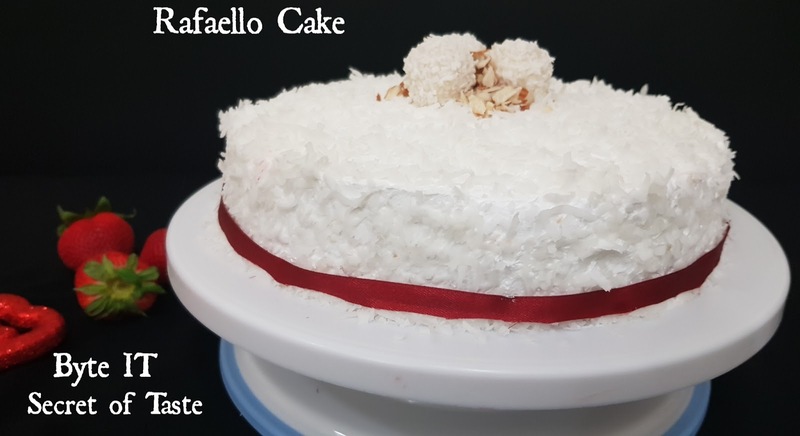 Yummy and soft rafaello cake is ready to be served. 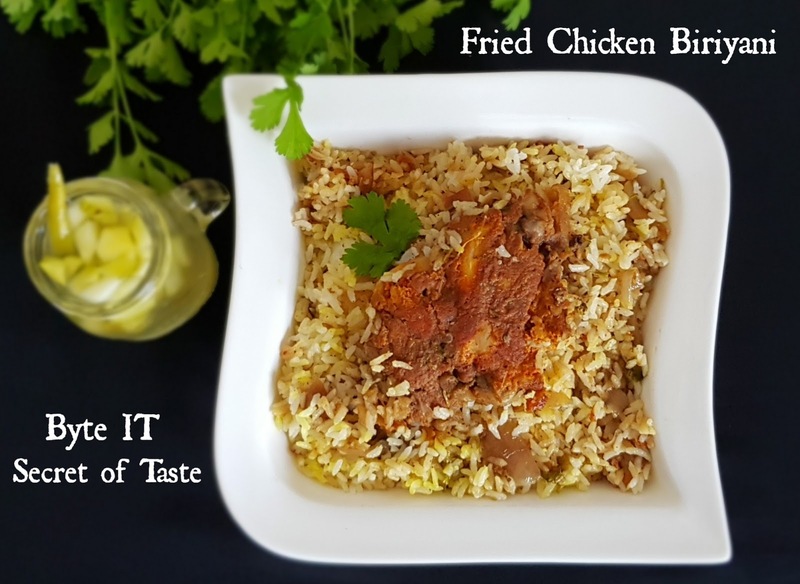 Here I am sharing an easy and delicious special fried chicken biriyani recipe. For this you can deep fry / shallow fry the chicken, then mixed with the masala and finally dum (Layering) which makes the biriyani heavenly taste. Let's check out the recipe. * Marinate the chicken with Kashmiri red chilli powder, turmeric powder, cornflour, ginger - garlic paste, egg, lemon juice and salt to taste for half an hour and fry it in oil till done. Keep aside. * Grind greenchilli, garlic and ginger. Keep it ready. * Heat oil in a pan, add sliced onions and saute till golden brown colour. * Add ginger - garlic - greenchilli paste and saute till raw smells disappear. * Add sliced tomato and cook till soft. * To this add turmeric powder and garam masala powder and mix well. * Add fried chicken pieces and coriander leaves. Combine well. Cover and cook for 5 minutes. Switch off the flame and keep aside. * Heat a deep pan, add ghee and oil. Add cardamom and cloves. Mix well. * To this add water and salt. Let it boil. * Cover and cook it until water dries off on medium flame. * And mix well. Cover and cook it on very low flame until rice cooked completely. * Take a deep wide pan, add the prepared chicken masala layer first. * Then add half of the cooked rice layer, sprinkle garam Masala, turmeric milk, 1 tspn ghee and few chopped coriander leaves over it. * Add remaining rice, sprinkle garam masala, turmeric milk, chopped coriander leaves, 1 tspn ghee and lemon juice. Cover it with Aluminium foil along with lid and cook it on very low flame for about 15 minutes. Serve hot with raita or chutney. 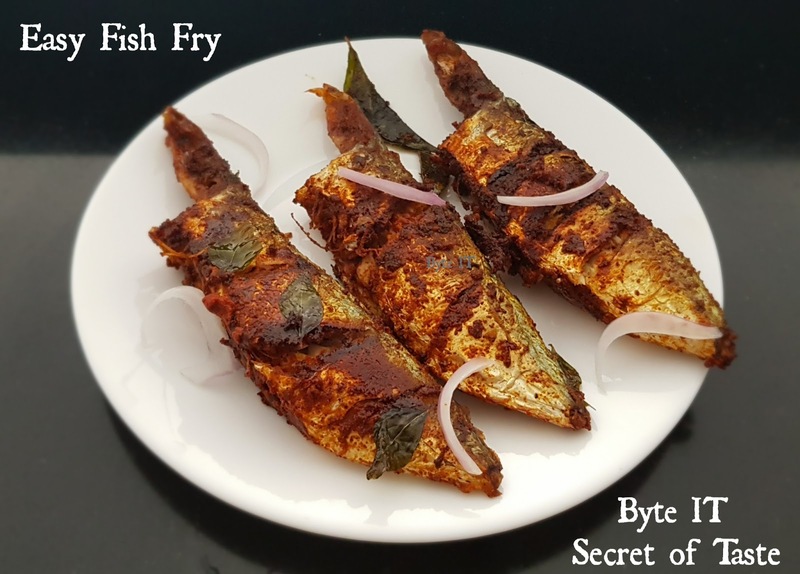 Easy and tasty fish fry with few ingredients. Let's check out the recipe. * Marinate the fish with red chilli powder, Kashmiri red chilli powder, pepper powder, turmeric powder, vinegar and salt for about 30 minutes or more in refrigerator. * Heat oil in a pan, add some curry leaves and fish. Fry all the sides of the fish until done. Tasty and easy fish fry is ready. Summer calls refreshing and soul soothing drinks! !So here comes a refreshing drink to beat the summer. Mango lassi is a delicious blend of mangoes, yogurt and cardamom powder. 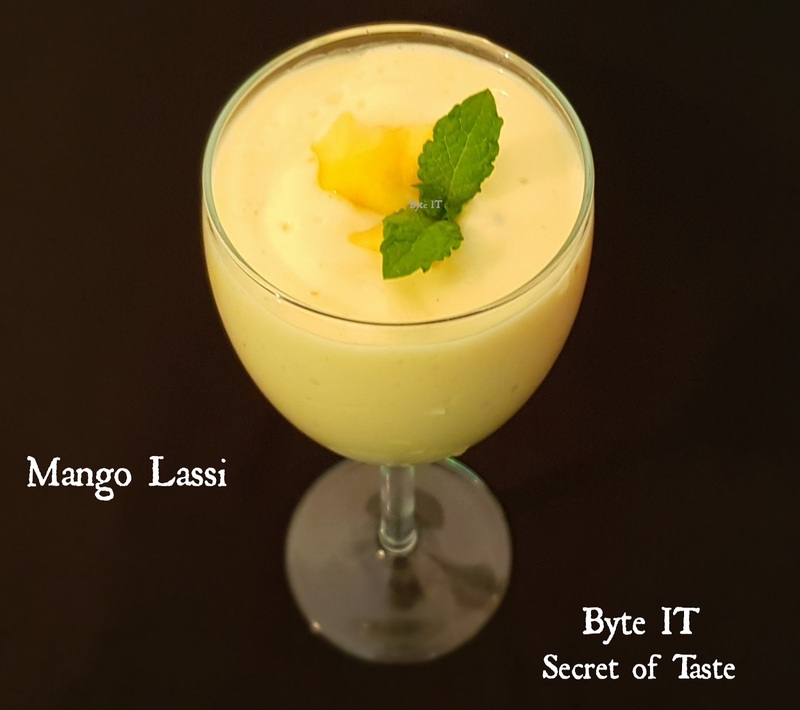 Let's check out the yummy, thick, smooth mango lassi recipe. 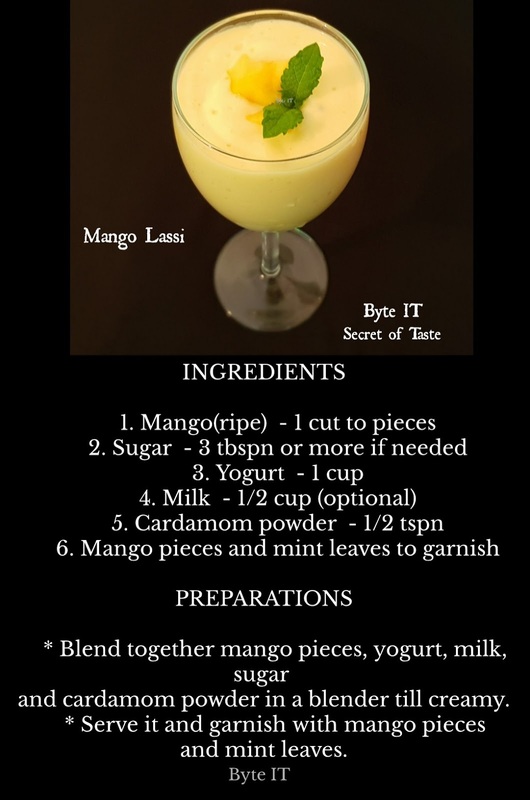 * Blend together mango pieces, yogurt, milk, sugar and cardamom powder in a blender till creamy. * Serve it and garnish with mango pieces and mint leaves. If you are looking to try something new, healthy and also delicious, grab a bag of horse gram from Indian store and try it. Muthira / horse gram has the highest Calcium amoung pulses and is one of the richest source of vegetarian protein. 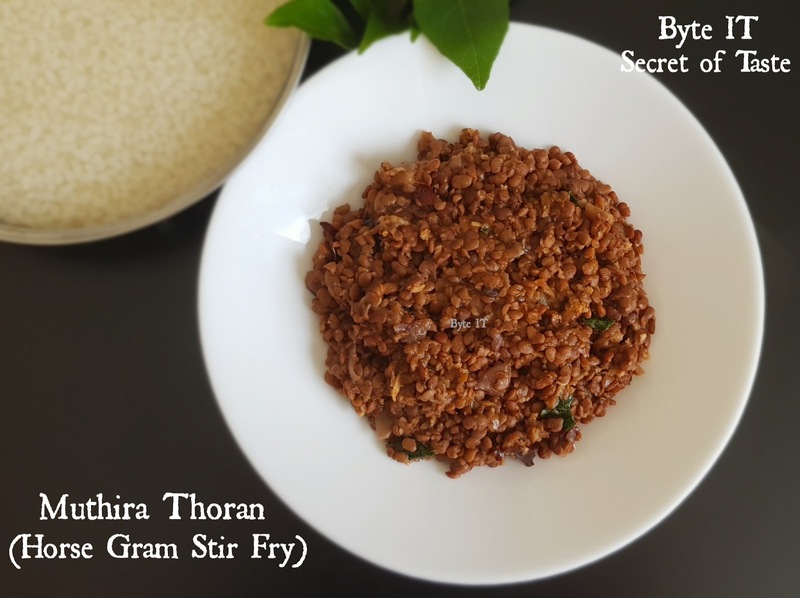 This simple and healthy thoran goes extremely well with kanji and rice. Let's check out the recipe. * Wash and clean the horse gram well. Soak it for 30 minutes. * Then strain water and pressure cook by adding salt and 2 cup water for about 4 - 5 whistle in medium flame. * Crush dried red chilli, garlic and small onion using mortar and pestle. Keep aside. * Heat oil in a pan, add crushed dried chilli, small onion and curry leaves. Saute till the raw smell disappears. * Then add grated coconut and saute it for 3 minutes. * Add the cooked horse gram and combine well. * Cook for few minutes until you get a semi medium thick consistency. Check the salt and add it. 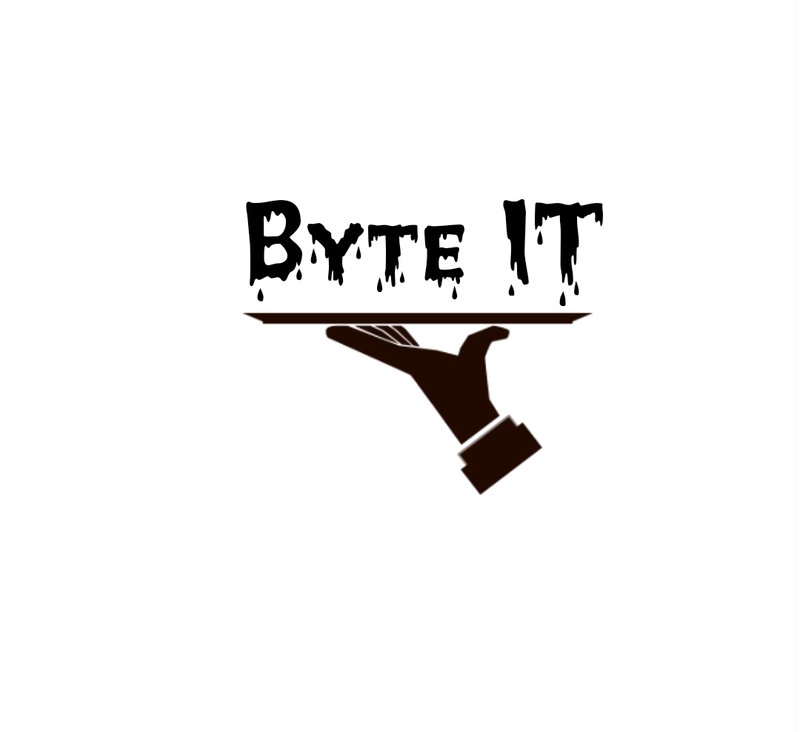 Serve hot with kanji, rice, puttu etc. 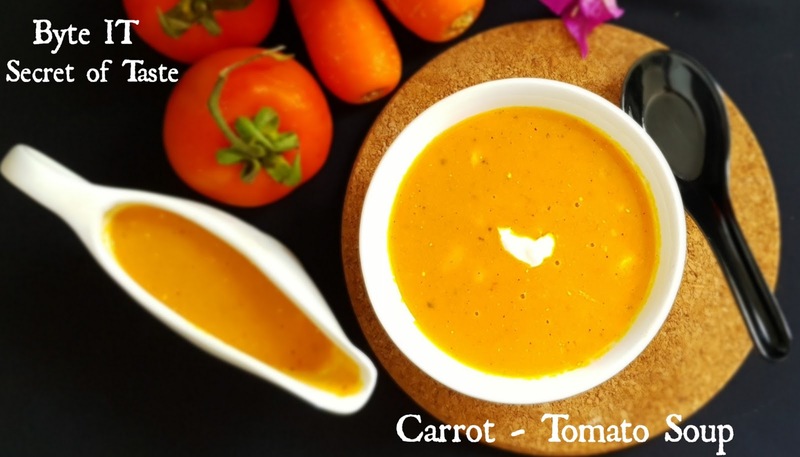 Creamy carrot - tomato soup is a healthy and easy soup made with carrot and tomatoes. It has the sweetness of the carrot and onions, along with the slight tanginess of the tomatoes. A soup for any season! * Heat butter in a pan, add chopped garlic and onion. Saute till soft. * Add pepper powder, oregano, dried red chilli and salt. Saute till raw smells disappear. * Add the grated carrot and chopped tomato and cook till all the water content disappears. * Switch off the flame and let it cool for some time. Grind it to fine paste by adding 1/2 cup water. * Heat this mixture in a pan with 1 and 1/4 cup water. Add sugar and oregano and combine well. Bring it to boil. * Add corn flour mixture to this stirring continuously. Reduce the flame and cook for another 2 - 3 minutes. * Add fresh cream, combine and remove from flame. Please subscribe my YouTube channel. Thank you! Khichdi is a dish from the subcontinent made from rice and lentils (dal) but other variations include bajra and moong dal khichdi. 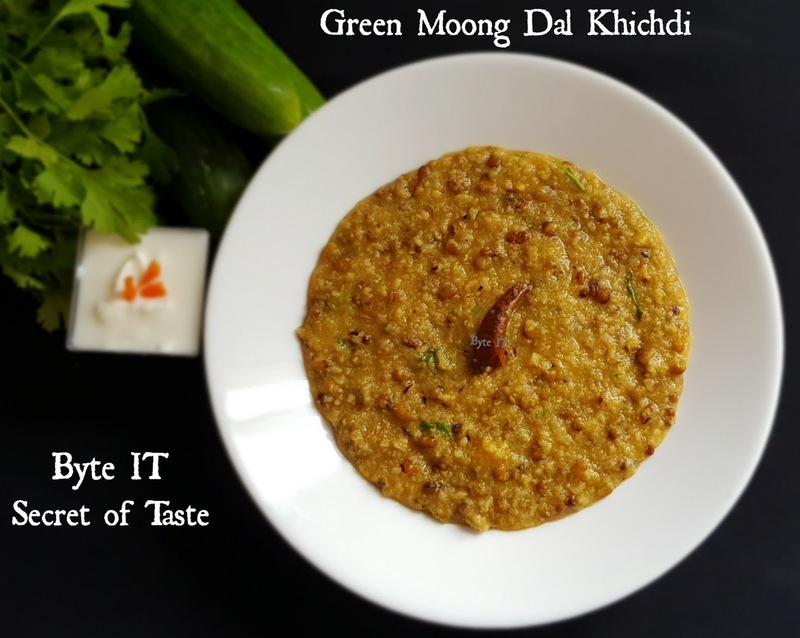 Here am sharing the recipe with green moong dal khichdi. Made of rice and green moong dal, this flavourful khichdi gets its punch from sauted onions and garlic, along with a traditional tempering of spices and spice powder. No words! Serve hot with curd or kadhi, for a homely meal that warms the heart. * Wash and soak rice and green moong dal for about 1 - 2 hours. After that strain excess water from it. Keep it aside. * Heat ghee in a pressure cooker. Add cumin seeds, asafoetida and dried red chilli. Saute it well. * Add crushed ginger garlic and saute again for a minutes. * Then add chopped onions and saute till onions become soft and golden brown colour. * To this add turmeric powder, red chilli powder and salt. Mix well until raw smell disappears. * Add soaked rice and green moong dal. Combine well and add enough water. Pressure cook it for 4 whistle. * Cool it completely and open the lid. * Add hot water if needed. * Sprinkle some coriander leaves and serve hot. Yummy green moong dal kichdi ready. Who doesn't love cheesy pasta dunked in a rich white sauce? This is so cheesy and creamy with simple steps. 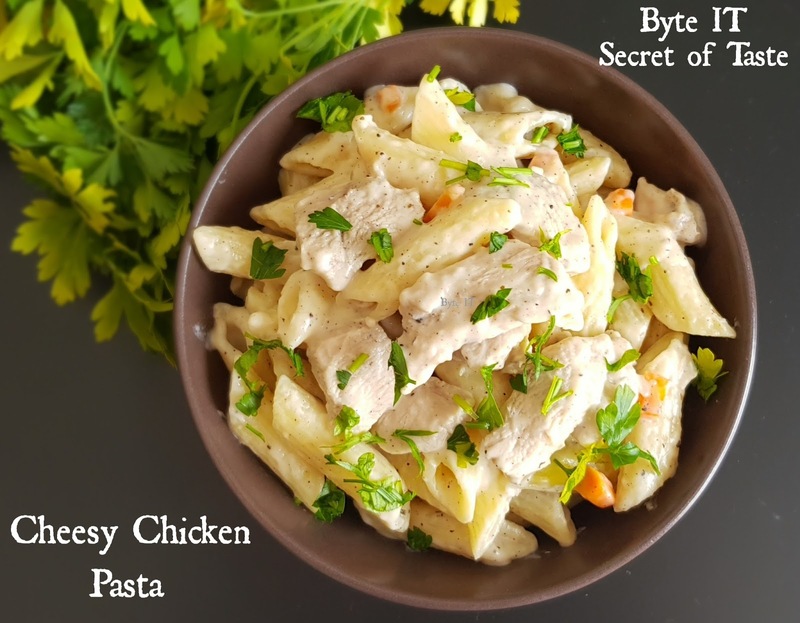 So here comes a very tasty and quick cheesy chicken pasta recipe to enjoy once in a while. Let's check out the recipe. * Marinate the boneless chicken pieces with pepper powder, lemon juice and salt to taste for about 15 - 20minutes or more. * Heat butter in a pan, add marinated chicken pieces. Cook till done. Add finely chopped carrot and saute it for a minutes. Switch off the flame and keep it aside. * In a large vessel boil water and cook pasta by adding oil and salt. * Cook the pasta till done. * When done, strain it and keep aside. * Heat a deep pan, add butter and saute chopped garlic. Saute till raw smells disappear (do not burn garlic). * Add all purpose flour and continuously stir till the raw smell of the flour goes. * Add milk in batches and continuously whisk till a thick paste is formed. * Add mozeralla cheese and oregano. Mix well. * Then add prepared chicken to the cheesy white sauce and mix well for a minutes. * Then add Cooked pasta. Combine well for a minutes. Add salt, pepper powder and oregano. Mix well. Cover and cook for few minutes. * Add few mozeralla cheese and mix well. Tasty cheesy chicken pasta ready. Garnish with parsley leaves.